Many patients are upset about how some medical gowns do not protect your modesty. Some gowns open in the back and can expose your rear. 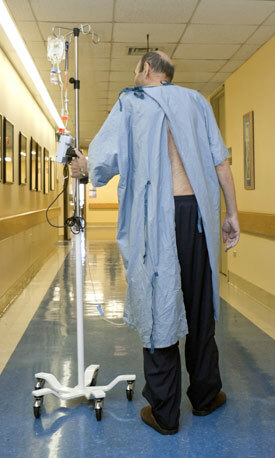 Patients could wear scrub shorts or pants under their gowns of course, but sometimes that is not an option. Some hospitals do provide scrub pants or shorts for patients who request them. The good news is that one medical clinic in Cleveland, OH has gotten some closed-in-the-back gowns. We encourage hospitals and clinics to look into purchasing closed-in-the-back gowns. Some medical gowns are not big enough for certain people. Hospitals and medical clinics should always strive to have plenty of medical gowns in different sizes available at all times.